Factors affecting biological integrity of agents/samples may be highly variable because of the diverse array of threat agent characteristics, environmental conditions, sample matrices, agent concentrations, adversary threat-agent preparation methods, and methods used in sample collection and transport. With respect to threat agent characteristics, agents range from labile protein toxins to stable mycotoxins, from labile RNA viruses to stable poxviruses, and from fastidious bacteria to very stable B. anthracis spores, all with varying degrees of purity. Less pure biological test samples may contain contaminating degradative enzymes, matrix components, overgrowing environmental organisms, etc., which may complicate isolation and identification. All of these variations make establishing a single sample-handling strategy to protect biological integrity very difficult. Problems with any one of these parameters can detract from the laboratory's ability to detect or identify the target threat agent while protecting forensic evidence. Attempts to stabilize one agent type against environmental factors and matrix effects may create adverse conditions for other agents. For example, freezing to stabilize a hydrated sample containing a protein toxin such as ricin against environmental proteases would in turn inactivate many viruses and bacteria. Gram-negative bacteria such as Brucella and Francisella tularensis are often stable for several days or weeks if dried in blood or proteinaceous materials, yet are unstable when dried in the absence of any protective matrices. Bacteria are subject also to their own autolysins, proteases, and nucleases and to the antimicrobial action of metabolites or compounds produced by environmental microflora. Such enzymatic or antimicrobial action could break down bacterial morphology, cause loss of viability, and alter anti-genic properties, staining characteristics, and other traits required for detection or identification. In general, the primary enemies of sample integrity are time, adverse temperatures, contamination, and in certain cases moisture. The integrity of a sample with regard to degradation, viability, and its antigenic makeup is typically minimally affected during short time periods (minutes to a few hours); however, as this time lengthens, the sample may lose integrity, especially hydrated samples. In such cases, temperature becomes critical. Refrigeration or packing on wet ice slows the enzymatic degradation, but does not completely eliminate it; nor does it completely stop microbial growth of environmental organisms such as fungi, which are well known to grow on refrigerated foods. Therefore, hydrated materials typically require freezing if they must be refrigerated beyond 2-3 days. It is difficult to establish consistent policy for such decisions. A suggested approach for making decisions concerning storage of unknown biological materials is to treat the biothreat material as though it is powdered milk. When dry, powdered milk is stable and does not degrade when stored at room temperatures (RT) or lower. However when hydrated, milk spoils rapidly at RT, but lasts for several days refrigerated (depending on the level of initial contamination), but should then be frozen for long-term storage. If frozen, freeze-thaw cycles should be avoided and may require splitting samples or sample extracts into aliquots that are individually used for subsequent analyses. When the identity of the biothreat agent is known, one should use conditions appropriate for that agent or class of agents. Stabilizing samples without altering the forensic evidence remains a critical consideration and requires research efforts in collaboration with law enforcement to determine how best to preserve a broad spectrum of biological agents while preserving forensic evidence. 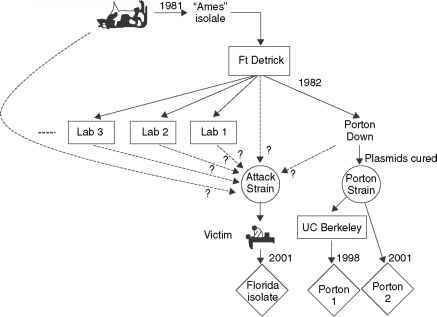 When one considers all the biological threat agents that are potentially available, it was fortuitous for forensic analyses that B. anthracis spores were used in the letters sent to the U.S. senators and the media in the fall of 2001. Spore powders are usually highly stable under desiccated storage conditions, and protecting the forensic evidence was much easier than if the material had been a more labile threat agent. In other words, there was minimal loss of viability (compared to what might have occurred with other infectious agents), samples were not degraded, and forensic evidence was not destroyed or its damage was minimal.